Manila (Philippines) – March 15, 2018 (travelindex.com) – More than 200 golf tour operators from around the world will participate in the largest series of golf familiarisation tours ever undertaken in Asia when the Philippines hosts the region’s annual gathering of golf tourism professionals, the Asia Golf Tourism Convention (AGTC), in April. The Asia Convention is organised by global golf tourism industry body IAGTO, and Chief Executive Peter Walton commented: “One of our objectives with AGTC each year is to ensure that the destination benefits directly from the event in a really significant way. 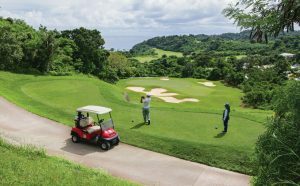 Tour operators will visit the three main golf destinations: Tagaytay Highlands, Clark-Angeles City and Boracay Island. They will also experience golf in metro Manila itself at the iconic Southwoods and Wack Wack golf clubs during the AGTC Golf Tournament, which will follow two days of meetings between seller companies and organisations across Asia – including destination tourist boards, golf resorts, golf clubs, hotels, transportation companies and other golf tourism service providers – and the golf tour operator buyers. Most courses in the Philippines are located south of Manila. The Tagaytay Highlands lie at the heart of this region, a retreat from the hustle and bustle of city life. The quiet resort town of Tagaytay sits alongside a volcanic lake amidst a stunning backdrop of volcanoes, with golf courses close by and near Lipa, an hour away. Pre-AGTC fam destination Boracay is a small but popular tropical resort island a short flight and ferry ride from Manila with a golf course, private beach coves and extensive facilities and activities at the Fairways & Bluewater resort, which takes up 15% of the island. Three hours by road from Manila and only 20 minutes apart, the twin cities of Clark and Angeles host another AGTC trip. They could not be more different – Clark is a freeport zone offering quiet, tree- lined avenues and casino hotels while Angeles City is a vibrant 24-hour city – but together they comprise a compelling Philippine golf destination with excellent golf courses nearby. AGTC 2018 will take place in Manila from 22-25 April and has already attracted a record number of buyers, with 75% emanating from the country’s principal Asia Pacific markets. In a clear sign that all pillars of The Philippines’ golf tourism industry are pulling together to attract golf visitors, Philippine Airlines has been appointed as the AGTC 2018 Official Airline. Find out more about the Best Golf Courses and the Top 25 Golf Courses in the Philippines here! Established in 1997, IAGTO is the global trade organisation of the golf tourism industry, and has over 2500 members in 98 countries including over 670 golf tour operator members in 65 countries, which control more than 87% of golf holiday packages sold worldwide and which collectively have annual sales of more than €2.1 billion. IAGTO runs annual Asia and North America Golf Tourism Conventions, along with regular Destination Conventions. IAGTO established the International Golf Travel Market, now owned and operated by Reed Travel Exhibitions, in 1997 and the Internatio nal Golf Travel Writers Association in 2000. IAGTO also runs the prestigious annual IAGTO Awards and the IAGTO Excellence Awards. IAGTO Ltd is registered in England as a Professional Membership Organisation. Registered No. 3507678 – UK SIC 9112, Concorde House, Grenville Place, London NW7 3SA, United Kingdom.